Os grid reference: SJ 3225 2435. 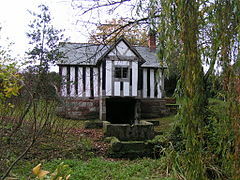 In the centre of the little village of Woolston, Shropshire, a few miles east of the Welsh border, is St Winifred’s Well, which rather curiously flows out from beneath a wooden building. This cottage was apparently once in use as the local court-house! The well has been a place of pilgrimage since the 12th century when the saint’s relics were rested here on their way to Shrewsbury Abbey, although it has never been as famous as the other St Winifred’s well at Holywell, Flintshire, but like that one this well was also built with the endowments of Lady Margaret Beaufort in the early 1500s. It was said to have had miraculous healing qualities. The place-name Woolston is derived from Walla-ton and Wella-ton with the ‘s’ added later, which both include the well in early reference, and probably meaning ‘well/spring beside a farmstead.’ The Welsh border is 4 miles to the west, Oswestry 4 miles north, and Shrewsbury 9 miles south on the A5 road. The holy well of St Winifred at Woolston seems to have been a place of pilgrimage and healing since the year 1138 when the saint’s relics were being brought by monks from Gwytherin in north Wales to Shrewsbury abbey where they were placed with those of her uncle, St Beuno. But Woolston seems to have become known due to the number of pilgrims being healed there after the saint’s relics were rested on their journey to Shrewsbury, though the spring was almost certainly there long before that; and so could it have had another dedication before the arrival of St Winifred! The half-timbered building which the well flows from beneath is said to date from the 16th-17th century and may have replaced an earlier chapel, according to Janet & Colin Bord in their book ‘Sacred Waters’ 1985. The authors go on to say: “Through the gate a path soon reaches the well cottage, and the well itself and the pool into which it flows are behind the cottage. The various stone troughs through which the water flows could be dammed up to form bathing pools. ‘Source – The Holy Wells Journal’ Autumn 1994 has some interesting information on this well in its section called ‘The Other St Winifred’s Wells’. It says this is: “a rare example of a well covered by a secular building, in this case a half-timbered cottage originally used as a court-house. The present sixteenth or seventeenth-century building may have succeeded a chapel…. the well itself and the pool into which it flows are seen behind the cottage.” The Journal goes on to say: “that the house replaced a medieval well-chapel is in fact far from certain; and even the patronage of St Winifred is atested only from the early 19th century.” And it says: “Woolston Well, dedicated, according to Hulbert’s History of Salop (1838) to St Winifred. Some have sought to explain this dedication (now locally forgotten) by supposing that the relics of St Winifred may have rested here on their way from Gwytherin in North Wales to Shrewsbury Abbey, in the twelfth century; but it is easily accounted for by the fact that certain small stones spotted with indelible red marks singularly resembling bloodstains are occasionally found in the water, which have obviously led to the former localizing here of the legend of the well which sprang up on the site of St.Winifred’s decapitation.” However, it is now known that these red spots on stones is a type of algae – the very same algae can be seen at Winifred’s other well at Holywell, Flintshire. The water of the well at Woolston is known to have had the power to heal broken bones and cure bruises and wounds, among other things, much like at Holywell. Of course, most of us know the “Legend” about St Winifred being beheaded by a local chieftain called Caradog at Treffynnon, having refused his advances to her. But she was healed by her uncle, St Beuno, afterwhich she became abbess of a convent at Gwytherin in north Wales. When she died in 650 AD her body was placed inside a church at that place; and in the Middle Ages her feast-day was held on 3rd November. Bord, Janet & Colin., Sacred Waters, Paladin Books, London, 1986. Hulbert, Charles., The History And Description Of The County of Salop, 1837-8. Hulse, Tristan-Gray & Fry, Roy., Source – The Holy Wells Journal., Vol 1, Cefn, St Asaph, Autumn 1994. Spencer, Ray., A Guide to the Saints Of Wales and the West Country, Llanerch Enterprises, Felinfach, Lampeter, 1990. Categories: Holy Well | Tags: Holy Well at Woolston in Shropshire, St Winifred's Well at Woolston in Shropshire (Salop) | Permalink.